Simple Ideas - the Stopp.it kayak drain bung! I can't really remember the last time I wrote anything about canoe or kayaking on this website - must blow the dust off the boats and get out a bit more in 2010! Anyway, if your a whitewater paddler you will know that whitewater kayaks have drain plugs to help get the water out after you take a swim. Its a big fear of kayakers that you will loose your drain plug and not be able to fill the hole - particularly when different makes of kayak have different types of drain plugs. This can be a particular problem on overseas or remote trip when you are unable to get to a shop to get your hands on a replacement. This is a nice simple idea from Harry Thaler with his Stopp.it drain bung replacement. Simply, change your drain bung fitting once and afterwards you can use any PET plastic bottle top (found all over the world) to keep water out of your kayak. Last Easter Iain Robertson and I made an epic attempt to canoe across Scotland from Kinlochleven to Perth. A journey that ended up taking us seven days after a long drag over Rannoch Moor in very poor conditions. Despite having been on numerous overseas expeditions last years cross Scotland journey still rates as one of the hardest things I have ever done. Like all journeys of this kind you say to yourself, ‘never again’. However we have recently been thinking about a follow up and have now put the second week of the Easter Holidays aside for Across Scotland V2.0. Again we will be allowing ourselves seven days to cover a distance of over 150km between Mallaig and Inverness. The journey will take us on the sea, over land, loch and white water river. We will have to paddle, improvise sail, pole, track, line and cruise –we will be taking one canoe each and been completely self sufficient for our journey. Start in Mallaig – paddle / sail down Loch Nevis to Tarbert. Portage from Loch Nevis to Loch Morar. Pole, track, line, drag and make use of any water and lochens from Loch Morar to Loch Arkaig. Paddle down River Ness into Inverness and the Sea. Sounds easy doesn’t it! Lets just hope for a bit of water in the rivers and strong Westerly and South Westerly Winds after Day One! See below for a Google Map of the route. The red is the sea, the green is definite portage (carry) and the blue is inland loch or river – I hope to up-load photos after the trip. I spent a bit of the weekend working on some of the logistics for next summers expedition to the Cascade Mountains. We made the decision a few weeks ago to add an open canoeing section to the trip. Although we will be mainly be based in the Mt. Rainier National Park, for the canoeing we have decided to head to the Bowron Lake Canoe Circuit in British Columbia, Canada . I first paddled the Bowron Lakes in 1996 and this was my first real taste of a wilderness expedition. 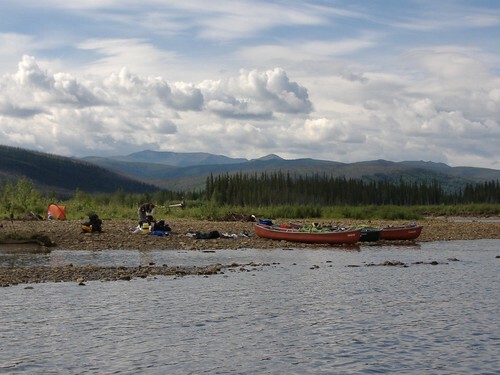 I was thinking back to the logistics of organising the 1996 trip – everything was done with fax machine or letter back then and it took months to book canoes or to get up-to-date maps delivered. When you made a telephone call across the Atlantic you had to be prepared for high phone charges and you were likely to be cut off halfway through your conversation. Today, I could have organised the whole trip from my laptop and then followed everything up on Skype. One of the thinks that I found were some really good Google Earth plugins for Mt. Rainier. One of the objectives for next summers trip is to trek the Wonderland Trail and another objective is to climb Rainier using the Camp Schurman Route. If you download this Google Earth file the Wonderland Trail is shown in Red and the Camp Schurman Route is shown in Blue. I also found this really good Google Earth USGS overlay for Mt Rainier. Again you can download that here. In the picture below both the routes and USGS layer are on. These resources will provide a useful tool to brief the team later in the year. Getting Google earth files for the Bowron Lakes was more problematic, however this Google Map My Map of the area shows the lakes involved in this fantastic 6 day canoe journey. If you haven’t messed around with the new terrain feature on Google Maps it is really worth looking at to help teach physical geography. Finally, my trawling of the Internet led me to this You Tube Google earth fly through of the Bowron Lakes. Now all I have to do is wait for next July!